Opening a book reveals a mystery to many of us. How are all those pages bound together? It looks so complicated. And the bigger question is “Could I ever make one myself?” There’s no doubt the answer is yes, and the best way to start is with the single signature. It is the foundation of most books we read (there’s just more of them in a typical book), and that’s why it’s chosen for this introductory course. Under Maaike’s energetic and experienced direction, you will quickly discover how easy it is to make. 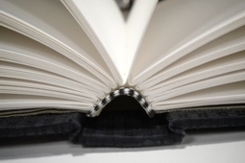 You’ll learn about the basic structure of a book and the tools and the techniques used in bookbinding. You’ll then go on to apply the single signature to several projects such as a basic notebook, a special card, and a guest book, choosing from a variety of washi supplied for this purpose. Finally Maaike will show you how to bind several signatures together for future larger projects such as journals or hard covered books and further explore the many possibilities of the one signature construction. After this, next time you open a book, it will be an open book to you! The Japanese honour accomplishment and have created a special category to which someone may be named after a lifetime of distinguished achievement in a particular field. They are named a “National Treasure”. Certain makers of washi have earned this recognition, and if there were a category for bookstyles, the Accordion-fold book would deserve this honour too. It lays flat when open, important for writing in it. 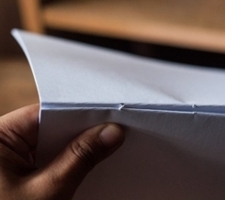 It features double pages which eliminate show-through and can display what’s in it by simply pulling the covers apart and stretching them out. This gives artists the possibility of making a continuous drawing crossing many pages but that can be seen all at the same time. Unlike every other book, if you use it to store things (photos, letters, notes, receipts or recipes), its covers remain parallel no matter how many things you stuff inside—and, as a bonus, it’s easy to make by anyone. Techniques learned: The use of basic tools, how to mark, score, fold and cut, and to paste papers and bookboard. Everyone is immediately impressed by the exposed sewn spine, characteristic of Japanese bookbinding, but the secret to its perpetual popularity lies within. Its inside pages are made entirely of washi, each folded in half so that although thin, strong and receptive of many kinds of media, there is no “show-through” from side to side. It has been a favourite of countless generations in Japan and of those who take our courses! 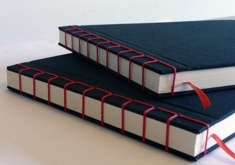 You don’t need previous bookbinding experience thanks to both its straightforward construction and ease of sewing (even if you can’t sew a button back on your shirt!). Easily made at home, it’s especially useful for notebooks, guest books, sketchbooks, or if you want to give a gift that will make you as popular as it is! Techniques learned: Use of the special properties of Japanese papers, measuring, cutting, and folding of interior pages, the Japanese procedure for piercing the pages and sewing them together to form the distinctive, exposed-stitched spine. Ever wonder why bestsellers, or most new publications for that matter, come out in hardcover first? Of course, it’s obvious: because it’s the most beautiful, durable and prestigious, not to mention the most familiar to us. In fact, given paperbacks, audio books, digital media like Kindle, etc., it is and always will be the book that will seem the most “real” to us. 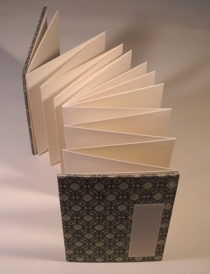 Learn how to make this traditional, hard cover book with its several “signatures” (usually four or eight pages folded together and sewn into the spine), along with using heavy card for the cover and covering it with traditional cloth or from a selection of colourful, patterned Japanese “chiyogami”. Maiike has done some léger de main to make it possible to complete the book (normally a two day project) in just one by making some of the essential components beforehand, so that every student will leave with a completed project by the end of the day. Techniques learned: Working with signatures, sewing, cutting, mounting paper onto cardboard, choosing adhesives, use of the square and other tools, calculating yield and basic bookbinding skills. In some way, Coptic-style bookbinding is the “origin of the species! You see, books once had to compete with the dominant communications technology of the time—scrolls. To do this the ingenious method was invented of folding up a scroll into pages and binding them together, and it presented many advantages. This later evolved into bound books as we know them today. Renée revisits this early bookstyle, but substituting the beauty of Japanese paper for parchment. 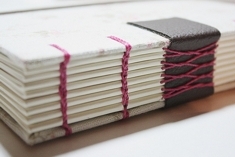 The pages are sewn together with cords, using a chain stitch which passes through the cover to create not only an elegant finished look, but as importantly, enables the book to lay flat when opened. Techniques learned: Basic bookbinding skills, measuring, cutting, assembling, tool use, and sewing principles and procedures.